Joseph Mellick Leidy was born in Philadelphia on September 9, 1823, the son of Philip Leidy, a hatter on Third Street above Vine Street. After the death of his mother, Catherine Mellick, in childbirth less than two years later, young Joseph was raised by Philip Leidy’s second wife, Christiana Taliana Mellick, a cousin of his mother. As a young boy, Joseph demonstrated a talent for drawing, but he was not an outstanding student at Reverend William Mann’s Classical Academy. He preferred to pursue his passion for plants, animals, and minerals in the outdoors rather than in the classroom. He spent much of his youth exploring Bartram’s Gardens and the banks of the Schuylkill River and Wissahickon Creek, often accompanied by his young African American friend, Cyrus Burris. 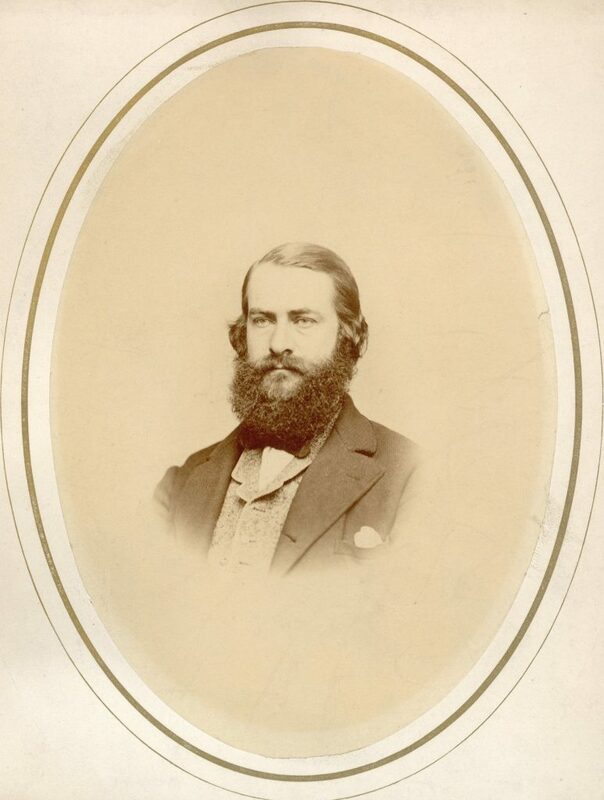 Immediately after his 1844 graduation from Penn’s Medical School, Joseph Leidy began the practice of medicine as his father demanded him to do. However, that same year he also found opportunity to further his interest in medical investigative procedures, in particular that of microscopy, first as an assistant to Goddard and then as dissecting assistant to William Horner, the current professor of anatomy at Penn. He also worked briefly in Professor Robert Hare’s chemistry laboratory and with Dr. James. B. Rogers at the Franklin Institute. The following year, 1845, he became involved with the dissection and drawing of snails for a book on North American mollusks written by Amos Binney and edited by Augustus A. Gould. The 1851 publication of this book brought Leidy immediate recognition, along with membership in Boston Society of Natural History and Philadelphia’s Academy of Natural Sciences. The Academy appointed Leidy as its librarian in 1845 and then as its curator in 1846, a position he would hold for the rest of his life. Just three years after earning his M.D. Leidy entirely abandoned his medical practice to devote his professional life to the study of living organisms. His rise was rapid and his output prodigious, quickly establishing Leidy as the foremost microscopist in America and the founder of American vertebrate paleontology. During his lifetime, he published over eight hundred scientific articles. His research included descriptive work on the evidence of fossils that proved horses had existed and become extinct in America long before they were reintroduced by the Spanish. He examined fossils found in the American West to discover many extinct species, and also assembled the first fairly complete dinosaur skeleton from bones found in New Jersey. Even before Darwin’s writing, Leidy described the disappearance of old species and the appearance of new species as well as of variations within a species. When Darwin published his theory of evolution and natural selection in 1859, Leidy quickly became a supporter. He saw the relationships between fossil skeletons, but did not publish the taxonomy of these animals as it related to evolutionary thinking; that would be done by younger men, Othniel Charles Marsh and Edward Drinker Cope. Much of Leidy’s work had direct bearing on medical practice. These studies focused not just on descriptive human anatomy but also on such varied subjects as the transplantation of fragments of human cancer to a frog, the identification of Trichina larvae in pork and the necessity of further cooking of meat, and the existence of small plant and animal organisms on many animal species (even humans). Leidy may even have been the first to use the microscope in forensic medicine when he examined blood on the shirt of an accused murderer to demonstrate that, since the red blood cells were not nucleated, the blood was definitely not that of a chicken as claimed but instead possibly that of a human. Leidy’s skills and knowledge led to multiple appointments in educational and scientific institutions. In 1853, upon the retirement of William Horner, Leidy became professor of anatomy in the University of Pennsylvania; he would teach Penn’s medical students for 38 years, and his 1861 anatomy textbook became the standard anatomical text for medical students for decades. Until 1872 the University of Pennsylvania was located at its Ninth Street campus, just below Market Street. Here Leidy had two dissecting rooms on the second floor of Medical Hall, adjacent to the museum, lecture, and student dissecting rooms. At one time or another he was involved with such medical institutions as Franklin Medical College, St. Joseph’s Hospital, and during the Civil War, Satterlee Military Hospital. In 1871 Leidy established the Department of Natural History at Swarthmore College, teaching there until 1885 when he founded the Department of Biology at the University of Pennsylvania, now located on its West Philadelphia campus. From then until his death, Leidy taught at Penn in both the Medical School and in the College. 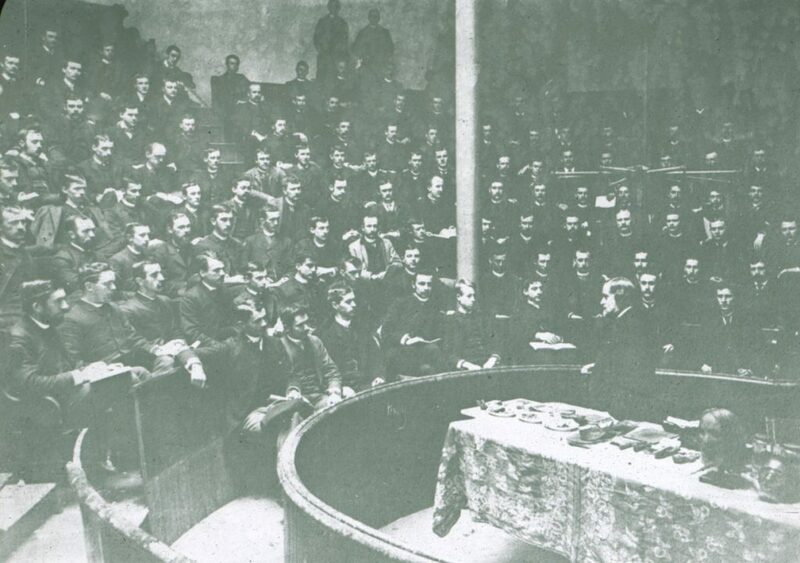 In 1885, Leidy was elected president of the Wagner Free Institute of Science of Philadelphia. For the last six years of his life, he was not only the curator of the Academy of Natural Sciences, he was also responsible for the expansion and maintenance of the natural history exhibits at both the Wagner Institute and the University of Pennsylvania. Not surprisingly, Leidy became the first president of the American Association of Anatomists in 1888 and 1889. He was a member of more than fifty societies, including the American Philosophical Society and the College of Philadelphia, and the recipient of many medals and honors, including the medal of the Royal Microscopical Society and the Cuvier Medal from the Academy of Sciences in Paris. He rarely, however, attended meetings away from Philadelphia. Joseph Leidy in 1864 married Anna, the daughter of Robert Harden of Louisville, Kentucky. They had an adopted daughter, Allie, and lived on Locust Street between Thirteenth and Juniper Streets in the center of Philadelphia. 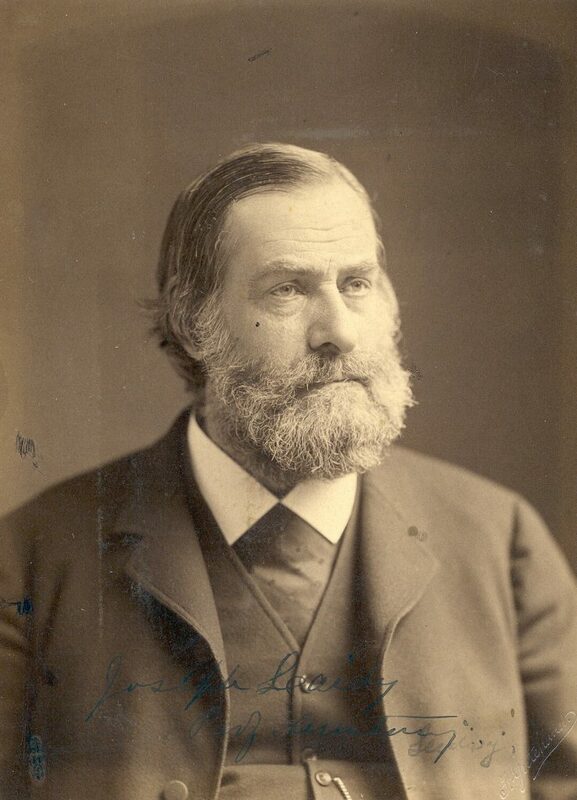 Joseph Leidy died at home on April 30, 1891.